From the New York Times best-selling author of The Accidental Billionaires and Bringing Down the House - the sources for the films The Social Network and 21 - comes the larger-than-life true tale of a group of American college buddies who brilliantly built a billion-dollar online poker colossus based out of the hedonistic paradise of Costa Rica. Meanwhile, the gray area of U.S. and international law in which the company operated was becoming a lot more risky, and soon the U.S. Department of Justice had placed a bull's-eye on Absolute Poker. Should they fold - or double down and ride their hot hand? 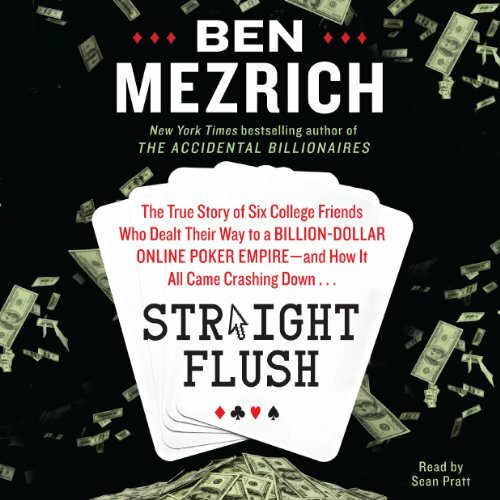 Straight Flush is an exclusive, never-before-seen look behind the headlines of one of the wildest business stories of the past decade. Makes you rethink your contempt for the Absolute Poker guys. I'm sure this is heavily biased towards the story they want told, but it makes you at least consider that they weren't all bad. There were moments where he seemed to be channeling William Shatner. If you liked the movie "Runner Runner" one of the storylines woven into it was the Absolute Poker story that is told in more detail (and with less dramatic license) in Straight Flush. Great story and a fun listen! What did you love best about Straight Flush? I loved the feeling I got listening to the story and trying to capture how the characters felt in different situations. The story from rags to riches to rags...all though not exactly. But I liked how the story evolved and it was fun to hear about how a few guys with an idea made a profitable business. High stakes, high flying, pure enjoyment! What an interesting behind-the-scenes peek into the Online Poker world! I had no idea what was, or is, really going on! This is my third book by this author, and I have enjoyed all three. They are well researched, extremely well written, and this one is also narrated very well. I feel like I still have an unanswered question after finishing, but it is only a minor detraction from an otherwise very good story. I do recommend this audiobook--I felt it was definitely worth the time and credit spent!! Would you try another book from Ben Mezrich and/or Sean Pratt? I have read other Ben Mezrich's books, and I enjoy them. I don't think I would listen to another Sean Pratt book. I would have liked the book to go deeper into the cheating scandals, and how/ why/ when the company opted not to separate player money from the operating funds of the company. This book only gives part of a chapter to the UB cheating scandal. It would have been much better to understand what the AP brass found out about who was cheating, when and why. The book seemed to be more focused on the the parties, drugs, and girls, less on how the Absolute Bet company was built. Just didn't care for the tone, and pace of the read. What else would you have wanted to know about Ben Mezrich’s life? umm.... This isn't a biography of Ben Mezirch. Not sure what do say here. I would like to see Ben do a follow up on the Full Tilt Poker/ Pokerstars stories, and focus on how all three of these companies came up in the business. Another fast moving, feels like you are there, story from Ben Mezrich. The usual themes: young folks with a laser focus on bringing home the brass ring. Great narration too.